My sister in law has been in love with dolls ever since I met her. One of her favorite collectibles is Barbies. She’s been a grandma for 18 years and has 15 grand children but just until recently she never had girls that loved Barbies….but-if this picture is any indication, that is changing. The last time I talked with her, she was getting in the mood to sew some Barbie clothes in hopes of turning them into Barbie lovers. When my girls were growing up I made gobs and gobs of Barbie clothes…I made Ken clothes too. 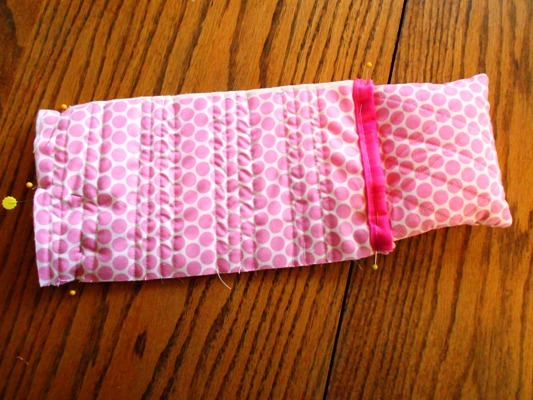 One of the kids’ favorite things I made were Barbie sleeping bags or beds. 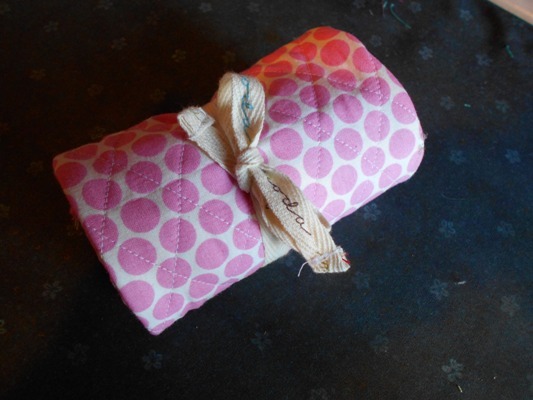 I thought I would write out the pattern for my sister in law and then thought why not write the pattern and post here as there might be others of you looking for a quick gift and a way to use up some fabric scraps. 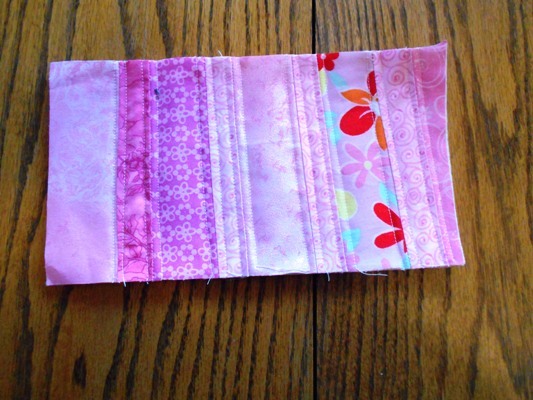 You will need some scrap fabric, scrap quilt batting and a bit of fiber fill. Here’s a completed bed. Aren’t they kind of cute?? I put strings on the ends of mine so they can be rolled up and tied like this if kids would like. You will need one 14″ x 5 1/2″ piece for the backing. Cut a lining piece slightly bigger than that. Cut a batting piece the same size. 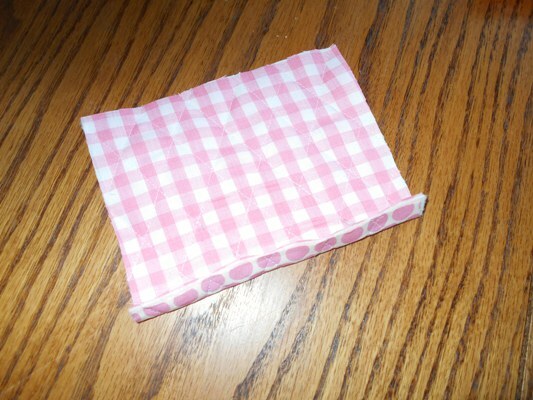 For the pillow cut one 4″ x 5 1/2″ piece cut batting and backing pieces slightly larger. Machine quilt the pieces. I did a cross hatch design. 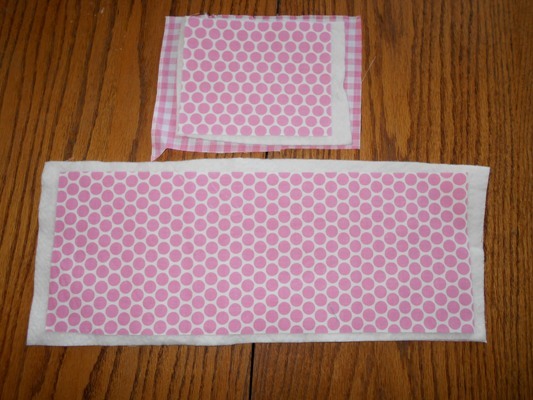 Trim the pieces so that they are 14″ x 5 1/2″ and 4″ x 5 1/2″. 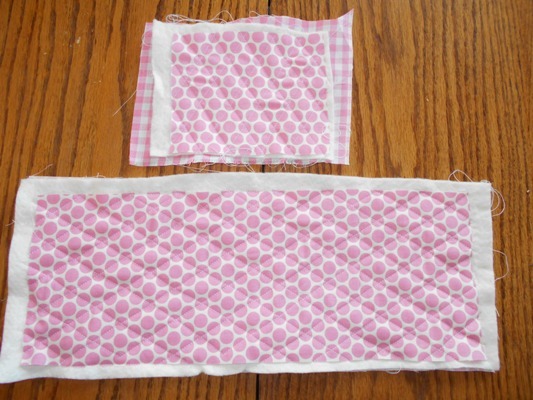 Press a 1/4″ seam up to the back side of the pillow piece as shown. 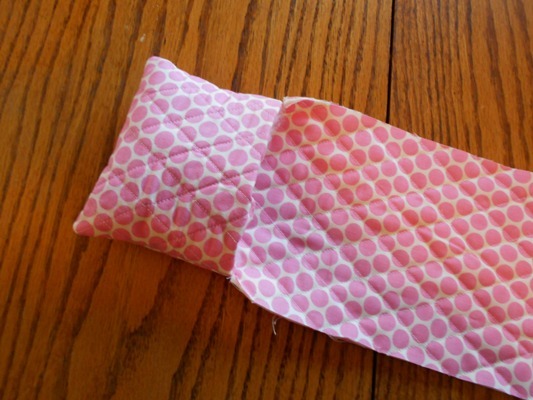 Layer the pillow right down onto the bed so that right sides are together. Pin in place as shown. 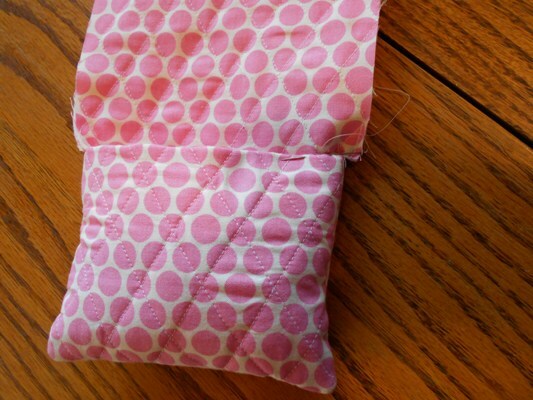 Sew the pillow down if place going from pin to corner to corner to pin. Turn pillow part right side out. Stuff lightly with fiber fill. Hand sew the opening closed. 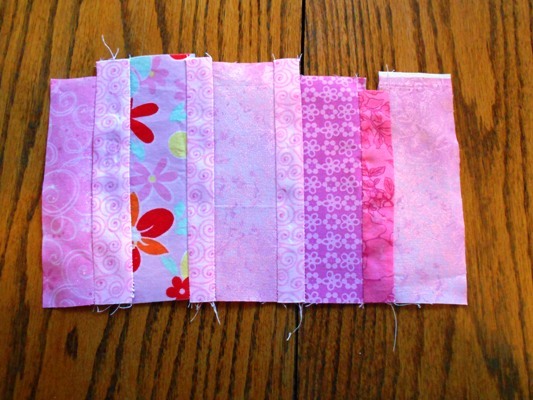 Sew 6″ fabric scraps together. Trim piece so that it is 10″ x 5 1/2″. Layer with a larger piece of batting and backing. Cut a larger piece of batting and backing. Layer and machine quilt. 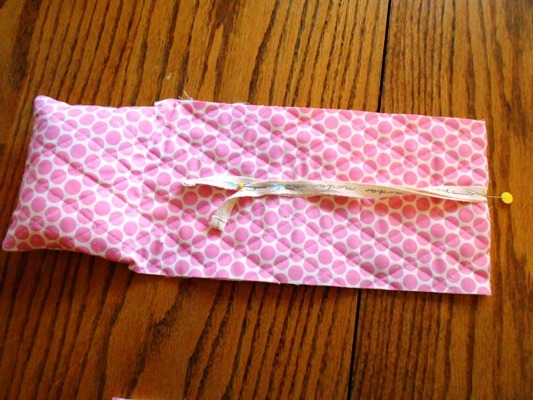 Cut a 2 1/2″ piece of fabric. Iron in half. Sew it down along the top edge as shown. 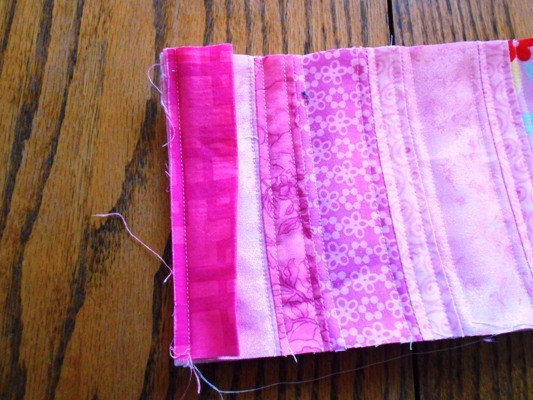 Turn the binding piece around to the back and stitch in place just as you would when binding a quilt. 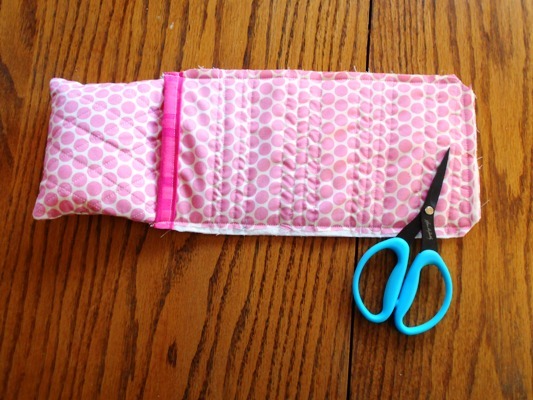 Layer the RIGHT side of the pieced unit onto the BACK side of the sleeping bag with right sides together. Pin in place making sure that the top matches up to where we clipped the seam earlier. Sew around as shown. 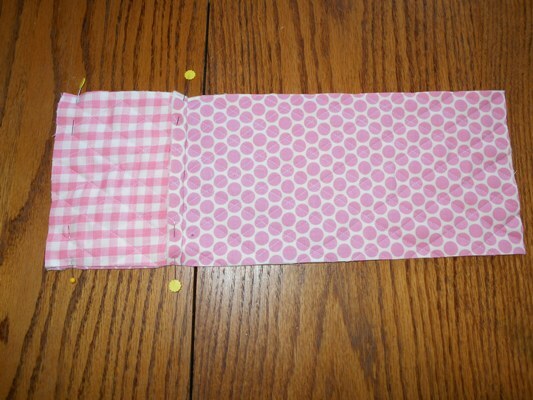 Back stitch several times near the clipped area so that the seam doesn’t come loose as the children play. Clip the corners. Turn right side out and you have a Barbie bed….make it in camouflage and you have a bed for G.I. Joe. 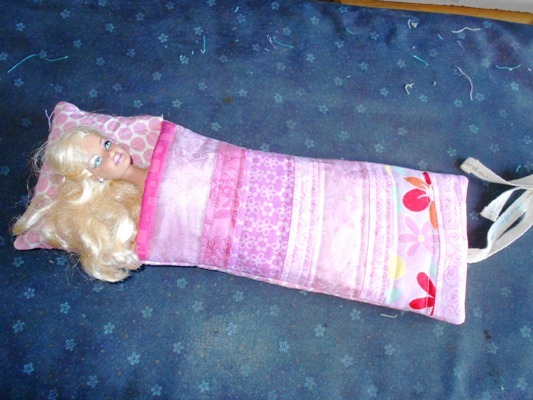 When my girls were little they had lots of Barbies…I think I must have make about 10 of these. They don’t take much time and kids enjoy them. 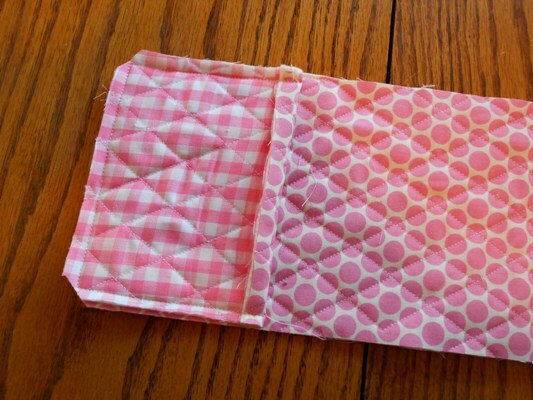 This entry was posted in Quilting, Tutorials on December 5, 2013 by Jo. Oh a woman after my own heart. I have made so many clothes and things for Barbies as a young child and as a mom. I can’t wait until my granddaughter is old enough to appreciate Barbies. She’s on the right track, she has already told me she wants to learn to sew, crochet and knit just like Gramma. She’s 3. 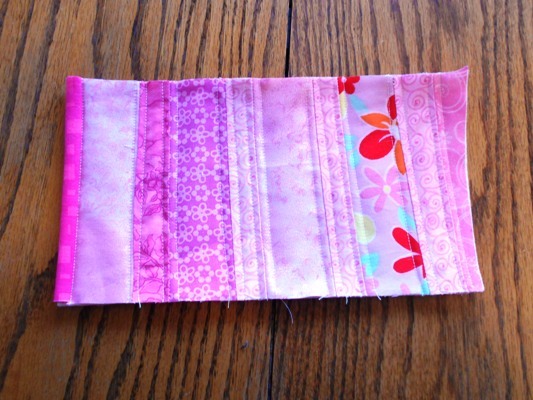 Thanks for the tutorial especially the idea for using the “moda” twill tape. I knew there was a reason I was saving them. My 9-y-o grand-daughter would rather play with Lincoln Logs!. BUT she has been knitting since she was 5 and is learning to sew. I have bought her a layer cake and we’ll make Layer Cake Lemonade when I’m there for Christmas. Thanks, Jo, for cluing me in to that pattern. I can hardly wait to start! Oh my gosh..too cute! I can see I will be making a few of these soon! I guess Barbie is sleeping alone! LOL I played w them until I was about 14. I still have some, collectors, that I don’t let the grands play w of course. Great idea. One addition that would be cute would be to put a strap up by the pillow, so the dolls can also be transported in it like a purse. Will have to make one for our 9 month old granddaughter when she gets a little older. Thanks. Stay warm. From northern Iowa . . . .
As I look at the Barbies I have on the shelf, I can not wait to make these for my Christmas Barbie action scene for under my Christmas Tree. My daughter would set them up each year so Barbie could enjoy Christmas. We still do it and she is 26!!! Thanks Jo. I must make two today as my two grand daughters are visiting this weekend. So cute & these girls go camping & they have the Barbie trailer! I made a larger version for baby dolls. My pre-k students love being able to put their babies to bed. I live in bush Alaska, where most of our homes don’t have beds on frames but just a mattress on the floor. This bed is a close match to what my students are used to sleeping in. Thank you for the great idea and instructions. P.S. My boys like the beds just as much as the girls. I’m 15 but I still love collecting barbies.